A turnpike road, shown in faded yellow ochre, forms the southern boundary of this map of the Berkshire chalklands. It runs from Speenhamland, at the bottom left of the plan, to Woolhampton, at the right. The mileage appears alongside the route in black-ink figures, and toll gates are marked. 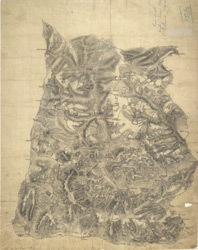 Correspondence in the Ordnance Survey Letter Book records that William Stanley, military draughtsman and author of this drawing, spent more than a year from February 1821 revising the plan. Some of these corrections are apparent near Thatcham at the bottom centre of the map.